The Komatsu Komfort Zone design uses a dual floating structure that protects operators. One set of vibration-dampening mounts separate the forklift’s frame from the engine and transmission. A second set of suspension mounts isolate the operator compartment from the frame. In addition, drive-train design reduces vibration transmitted from the differential. Operator visibility is a key to productive forklift operations. The newly designed EZview mast and low-profile dash display gives an unrestricted view of the fork tips and surroundings. In the rear of the AX50, the upper corner of the counterweight angles sharply to give optimum visibility when moving in reverse. The AX50 Fully Hydrostatic Power Steering system reduces operator fatigue by eliminating kickback and allowing easy steering, even while the forklift is stationary. A small-diameter steering wheel improves operator feel and control. Hot engine air and exhaust gases are tiring to the operator. On the AX50, angled ports aim hot engine air away from the operator while traveling in reverse. Exhaust vents located low on the counterweight keep exhaust gases away from the operator and also away from the floor to avoid stirring up dust. 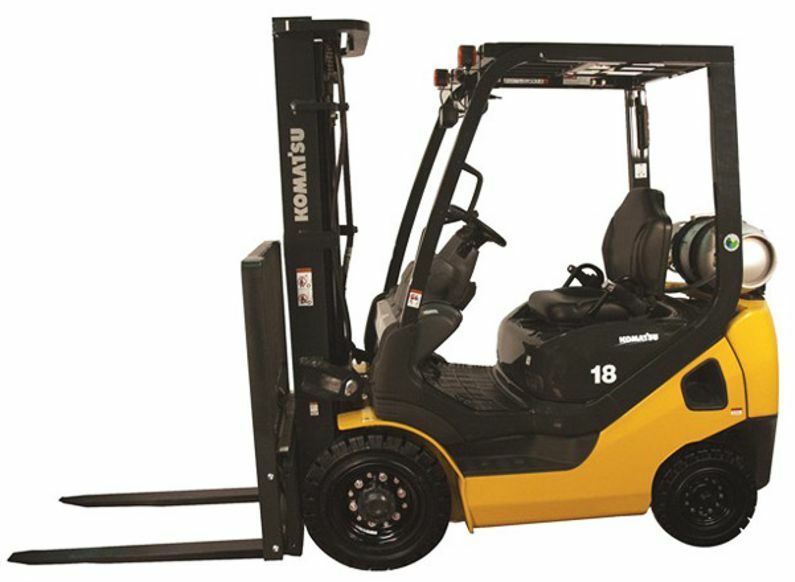 A new transmission, designed and manufactured by Komatsu Forklift Limited, handles the high torque provided by the powerful K21 engine. A high-capacity oil cooler protects the torque converter, and an aluminum alloy transmission case improves heat dissipation. O-ring face seals designed for high-temperature, high-speed applications reduces the possibility of leaks in the pump, power steering circuit and torque converter cooler. KOPS Plus – standard on the AX50 – locks out lift, lower, tilt and traveling functions when the operator leaves the seat for more than three seconds. They do not resume until the operator returns to the seat and resets the controls. A flashing yellow warning light alerts the operator when the KOPS lock is activated. In addition, the forks cannot be lowered while the key is in the off position.